District names, main objects. Map for publishing, design, printing, publications, arts, projects, presentations, for architects, designers and builders, business, logistics. Separated layers: streets and roads, color fills, road labels, names, halo, scales. Messages on Twitter today seem to be almost exclusively concerned with tributes to the life of Michael Jackson. See also a Wellington Printable Map, New Zealand, exact vector street map, V27.11, fully editable, Adobe Illustrator, G-View Level 13 (2000 meters scale), full vector. 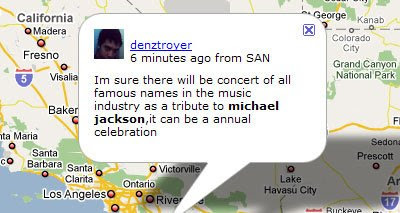 Mibazaar has created a Google Maps mashup that shows the latest messages about Michael Jackson from Twitter. The map lets you view in real-time tributes to Michael Jackson from around the world. As usual Mibazaar is allowing anyone to embed the map in their own website. In the UK one national newspaper, The News of the World, has already embedded the map on their website.